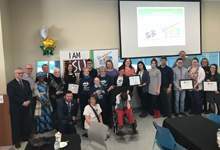 Today, over 100 volunteers attended a Volunteer Week reception at the Paul Reynolds Community Centre, an annual event hosted by the City of St. John’s in partnership with the Memorial University Student Volunteer Bureau. The Building Healthy Communities award is presented annually to individuals and/or groups in St. John’s who are helping to create vibrant communities and enhance the quality of life for citizens through delivering leisure programs and services. This year three Building Healthy Communities awards were presented to recipients Helen Murphy, L’Arche Avalon, and Patsy Yetman. Information about today’s winners are contained in the attached backgrounder. Helen’s passion for social justice, inclusion and community development in her volunteer work is leading the way for a healthier, more connected community where everyone feels valued. L’Arche Avalon - L’Arche Avalon’s goals include the establishment of homes for individuals with intellectual disabilities and their live-in assistants. They plan and host gatherings which reflect the L’Arche model of community and celebrate diversity, promote socialization, enhance belonging and support mutuality. This group of dedicated volunteers offer regular activities that support the well-being of members including music, leisure and recreation. Examples of activities that are helping to foster the growth of this community include monthly walks and jam circles offered in collaboration with MUN School of Music. L’Arche Avalon truly captures what it means to be a welcoming and inclusive environment in the city of St. John’s, by inviting participation by all, no matter their abilities. Patsy Yetman - Patsy is a committed and active volunteer with the City of St. John’s Seniors Advisory Committee, as an Ambassador with the City of St. John’s and with the Government of Newfoundland and Labrador as the Vice Chairperson on the Buildings Accessibility Appeal Tribunal Service NL – appointed by the province of Newfoundland and Labrador. Those who nominated Patsy shared that she is a community champion, someone who is always willing to help anyone in need. Patsy contributes to community social programs, and helping others live a healthy life by coordinating a local seniors’ walking group. She has volunteered in the recreation and wellbeing community with the Tely Ten Road Race for 20 years and with program like Kids Eat Smart at Vanier School, helping build healthier lives for our future generation.